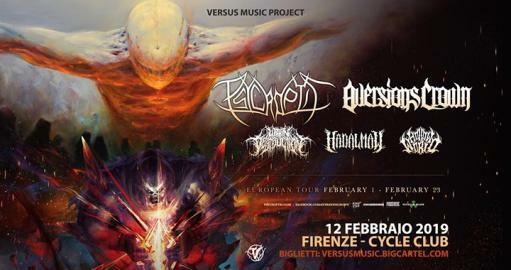 Versus Music Project is happy to announce the arrival in Italy of one of the first big tours of 2019 for lovers of deathcore and death metal. Back in Europe the AVERSIONS CROWN, Australian pioneers dell'Aliencore, in a show from co-headliner with fellow national masters of technical death metal PSYCROPTIC. Special European guest for the occasion will be the slam of the Slovenians WITHIN DESTRUCTION, already recently protagonists in Italy of the last ROAD TO DISSONANCE TOUR and WE ARE DEATHCORE FEST in 2018.